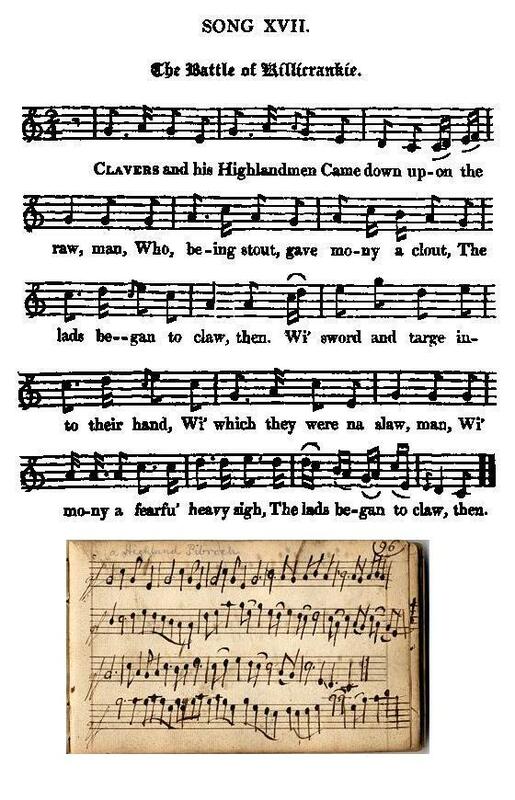 from David Herd's "Collection of Ancient and Modern Scottish Songs", Volume I, page 102, 1776, titled "Gilliecrankie"
and Hogg's "Jacobite Relics", Volume I, N°17, page 61, 1819, titled "The Battle of Killicrankie"
and "Irish Gilekrankey" in Henry Atkinson's tunebook (1694). Upon the structure of the present lyrics, with the expletory syllable concluding every second line, alternating with a line with internal rhyme, are modelled the ensuing Killiecrankie songs, as well as Adam Skirving's Prestonpans song. Autres mélodies sur "Killiecrankie"
La stucture de ce chant, qui alterne un vers avec rime interne et un vers prolongé par un mot monosyllabique explétif, sert de modèle aux autres chants sur Killiecrankie, y compris le chant d'Adam Skirving sur Prestonpans. The lads began to claw, then. Their riggings paid for a', then. The lads began to fa', then. That play'd them sic a paw, then. Cried, " Furich,  Whigs awa, man." They bred a horrid stink, then. A' fled and ran awa, then. Oh rig in di ! oh rig in di! Before ye win awa, then. 7. O fie for shame, ye're three for ane! Because they ran awa, then. And Willie'd run away, then. Des Highlands disposés en ligne. Voilà que tous ces diables d'hommes cognent. Sont franchis; la vague s'élance. D'estoc et de taille l'on ferraille. Et bientôt leurs soldats tombent à terre. Lui-même leur fait cette triste farce. Avec des "Fuirich,  Whigs!" sur eux qu'on lâche! Colmatent le flanc pour l'attaque. Et prendre le large leur semble idoine. L'Ecosse perdrait le roi Jacques? Och rig in di ! Och rig in di! Voulez-vous que tous ses os craquent? Juste un mot ou deux! Restez un peu! Laissez-la vous flatter le cou! Et c'est vous qui l'emporterez, que diable! 7. N'êtes-vous pas honteux, hélas! A trois contre un! Et qui l'emporte? Habits rouges des Stuarts et couards! Willie pourrait alors demander grâce! Claver: John Graham of Claverhouse. The Solemn League and Covenant was an agreement between the Scottish Covenanters and the leaders of the English Parliamentarians. It was agreed to in 1643, during the First English Civil War. After the Restoration the English Parliament passed the Sedition Act 1661, which declared that the Solemn League and Covenant was unlawful. Fuirich (also verse 6): Gaelic for "Stay, stop!" Sir Evan Dhu: Lochiel, 17th Chief of Clan Cameron. McLean: Baronet Sir John McLean. Ochoin a ri! : Alas for the Chief! The same phrase is to be found in The Highland Widow's Lament  Claver: John Graham de Claverhouse. La Ligue et le Covenant était un pacte entre les Covenantaires écossais et les chefs des parlementaires anglais. Il avait été conclu en 1643, pendant la première guerre civile anglaise. Après la Restauration le Parlement anglais votale "Sedition Act" en 1661, qui déclara contraires à la loi la Ligue et le Covenant. Fuirich (cf. aussi strophe 6): Gaélique pour "Arrêtez-vous, stop!" Sir Evan Dhu: Lochiel, 17th Chef du Clan Cameron. Hollandais en angl. "Hogan-Mogan": cf. La bande de rebelles. In 1689, after William of Orange had ousted King James II the Scottish Highland clans were to a great extent sympathetic to their former King. When John Graham of Claverhouse raised the Royal standard for King James II, most of the Highland Chiefs joined this "Jacobite" revolution, largely through the influence of Sir Ewen Cameron of Lochiel, XVIIth Chief of Clan Cameron who had been engaged in forming a confederation of clans loyal to James. When, therefore, Dundee came to Lochaber (*), Sir Ewen was able to give him an exact estimate of the support he was likely to receive. A force of about 1,800 men and a few horse had joined Dundee when he heard that General McKay, in command of the governmental troops, was advancing towards Inverness. Bonnie Dundee was determined to intercept McKay near Blair Atholl and, regardless of the disparity in numbers, bring him to battle. Many of the clans, including 500 additional Camerons, had not yet arrived. Dundee, however, requested Sir Ewen to follow with the small body of Camerons (240) he then had. With this "small band", they entered Atholl, where they were soon joined by about 300 Irish under the command of Major-General Cannon. Proceeding on their way, they arrived at Blair Castle on July 27th. Intelligence reports soon related that Mackay had just entered the Pass of Killiecrankie, heading towards the Atholl Basin. Strategically the pass was of great importance, as it controlled a crucial north-south route through the Highlands. Dundee, marched at the head of his troops to meet Mackay's army, which numbered about 3,500 foot and two troops of horse. These men were mostly Lowland Scots and veterans of the Dutch wars. Just left of the center, which consisted of the few horse Dundee commanded and forty of his "old troops," Sir Ewen took up his position at the head of the Camerons. Though there were great intervals between Dundee's battalions and a large void space left in the center, the line could not possibly be "stretched" so as to equal that of the enemy. Wanting men to fill up the void in the center, Sir Ewen was not only obliged to fight Mackay's own regiment, which stood directly opposite to him, but also had his flank exposed to the fire of Leven's battalion. Further diminishing his Cameron forces of only 240 men was that 60 were sent as Dundee's advance guard. By the time Dundee got his army in order it was well on in the afternoon. They were held back until near sunset. At seven o'clock Dundee gave the order to advance, upon which the Highlanders dropped their plaids and haversacks and advanced. Sir Ewen, after ordering his men to follow Dundee's command, seems to have been much encumbered by the use of "the only pair of shoes in his clan. "He sat down by the way and deliberately pulled off the footwear that crippled him. "It is incredible with what intrepidity the Highlanders endured the enemy's fire; and though it grew more terrible on their nearer approach, yet they, with a wonderful resolution, kept up their own, as they were commanded, till they came up to their very bosoms, and then pouring it in upon them all at once, like one great clasp of thunder, they threw away their guns and fell in pell-mell among the thickest of them with their broadswords. After this the noise seemed hushed; and the fire ceasing on both sides, nothing was heard for some few moments but the sullen and hollow clashes of broadswords, with the dismal groans and cries of dying and wounded men." They bred a horrid stink, then." Unfortunately, Dundee fell at the close of the battle, mortally wounded by a shot about two handbreadths within his armor, on the lower part of his left side. The Highlanders, though they had to mourn the loss of about one third of their army, secured a complete victory. Few of the enemy escaped, but having lost their brilliant commander, the war may be said to have ended - before it was well commenced - by a Highland victory; perhaps the most brilliant on record. (*) Lochaber is the area around Fort William and Ben Nevis and the homeland of Clan Ranald of that ilk, Clan McDonald of Keppoch and Clan Cameron. Source: Clan Cameron Archives Sir Ewen Cameron de Lochiel et le Clan Cameron à Killiecrankie. En 1689, après que Guillaume d'Orange eut évincé le roi Jacques II, les clans des Hautes Terres d'Ecosse demeurèrent majoritairement fidèles à leur ancien souverain. Si, lorsque John Graham of Claverhouse leva l'étendard royal pour le roi Jacques, la plupart des chefs de clans se rallièrent à la rébellion "Jacobite", on le doit surtout à Sir Ewen Cameron of Lochiel, 17ème Chef du Clan Cameron qui s'était employé à constituer une confédération de clans partisans des Stuarts. Aussi quand Dundee se présenta à Lochaber (*), Sir Ewen put lui indiquer avec précision l'importance des effectifs susceptibles de rallier sa cause. Une armée d'environ 1.800 fantassins et quelques cavaliers avait rejoint Dundee quand il apprit que le Général McKay, à la tête d'une armée royale, marchait sur Inverness. Il décida de l'arrêter près de Blair Atholl et de lui livrer bataille malgré son infériorité numérique. Plusieurs clans, dont un renfort de 500 hommes du clan Cameron, n'étaient pas encore arrivés. Dundee demanda à Sir Ewen de le suivre avec le petit groupe (240) de Cameron dont il disposait. Ils entrèrent donc en Atholl, bientôt rejoints par 300 Irlandais environ, sous les ordres du général Cannon, et parvinrent à Blair Castle le 27 juillet 1689. C'est là qu'ils apprirent que McKay venait de s'engager dans le défilé de Killiecrankie, sur la route du bassin d'Atholl. Ce col avait une grande importance stratégique sur l'itinéraire nord-sud traversant les Highlands. Dundee marchait à la tête de ses troupes à la rencontre de l'armée de McKay qui comptait 3.500 fantassins et deux escadrons de cavalerie. Il s'agissait pour l'essentiel d'Ecossais des Lowlands et de vétérans des campagnes de Flandres. Juste à la gauche du centre occupé par la cavalerie commandée par Dundee et par ses "vieilles troupes", Sir Ewen se plaça à la tête des Camerons. Bien qu'il y eût de grands intervalles entre les bataillons de Dundee et un large vide au centre du dispositif le front ne pouvait être étiré pour ête couvrir lel front adverse. Manquant d'hommes pour combler le vide au centre, Sir Ewen dut combattre le régiment commandé personnellement par McKay, placé juste en face de lui, alors que son flanc essuyait le feu du bataillon de Leven. Sa petite compagnie de 240 hommes seulement, se vit amputée de 60 éléments qui vinrent constituer l'avant-garde de Dundee. Le temps que ce dispositif se mette en place, l'après-midi était très avancée, mais l'on attendit encore qu'il fasse presque nuit. A sept heures, Dundee ordonna de faire mouvement et les Highlanders déposèrent leurs plaids et leurs havresacs, puis s'avancèrent. Sir Ewen commanda à ses hommes de suivre Dundee. Il semble qu'il ait été très gêné par l'usage de "la seule paire de chaussures de son clan". Il s'assit sur le bord du chemin et se débarrassa de cet encombrant équipement. "C'est avec une folle intrépidité que les Highlanders endurèrent le feu ennemi, toujours plus dévastateur au fur et à mesure qu'ils progressaient. Obéissant aux ordres reçus, ils s'abstinrent pourtant stoïquement de riposter, jusqu'à ce qu'ils soient au contact de l'adversaire. Alors ils firent feu tous ensemble, un véritable coup de tonnerre. Après quoi, ils jetant au loin leurs fusils, ils se ruèrent pêle-mêle sur le gros des troupes adverses avec leurs larges épées (broadswords). Ensuite, pendant quelque temps, ce fut presque le silence- on avait cessé de tirer des deux côtés - , si ce n'est, obstiné et sourd, le martellement des lames, les gémissements horribles des blessés et les râles des mourants". Malheureusement, vers la fin de la bataille, Dundee fut mortellement blessé au bas ventre par une balle qui avait pénétré profondément en dessous de son armure. Les Highlanders, tout en déplorant la perte d'environ un tiers de leur armée avait remporté une victoire complète. Rares furent dans les rangs ennemis ceux qui en réchappèrent. Mais la perte de leur brillant commandant marquait par cette éclatante victoire Jacobite, peut-être la plus brillante de toutes les annales, la fin de la guerre, avant qu'elle n'ait vraiment commencé. (*) Lochaber est la région qui entoure Fort William et le Ben Nevis et le pays d'origine des Clans ClanRanald de Lochaber, McDonald de Keppoch et Cameron.